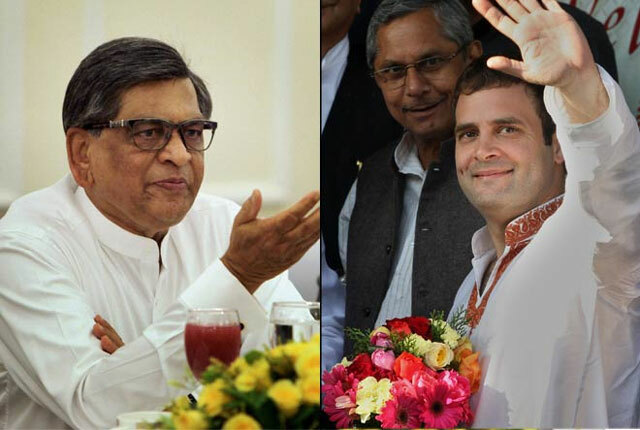 Former Karnataka Chief Minister SM Krishna confessed that he was forced to quit the Congress Party due to the interference of Rahul Gandhi in all the matters though he wasn't the party president by then. He alleged Gandhis hadn't even bothered to bring many subjects to the notice of then PM Manmohan Singh while taking them forward. SM Krishna served as Congress Leader for 46 years. He joined BJP in the year 2017. Addressing the BJP Activists in Maddur, SM Krishna told: 'I was the External Affairs Minister in UP Government from 2009 to 2014. We felt suffocation in the Congress Party at that time. Congress had no control over its alliance parties. That is when biggest scams like 2G Spectrum, Coalgate and Commonwealth took place. Such situation arises when there is no able leadership. Quit Congress as Rahul issued an order denying cabinet berth for leaders above the age of 80 years'. SM Krishna is still a key leader in regions like Mandya, Mysore and Tumkur which were dominated by the Gowda Community. Nama Received A Big Favour From Naidu?